My letter to then Secretary of State designate Warren M. Christopher exhorted him to assert US foreign policy at home because if you cannot assert it at home you cannot assert it abroad. 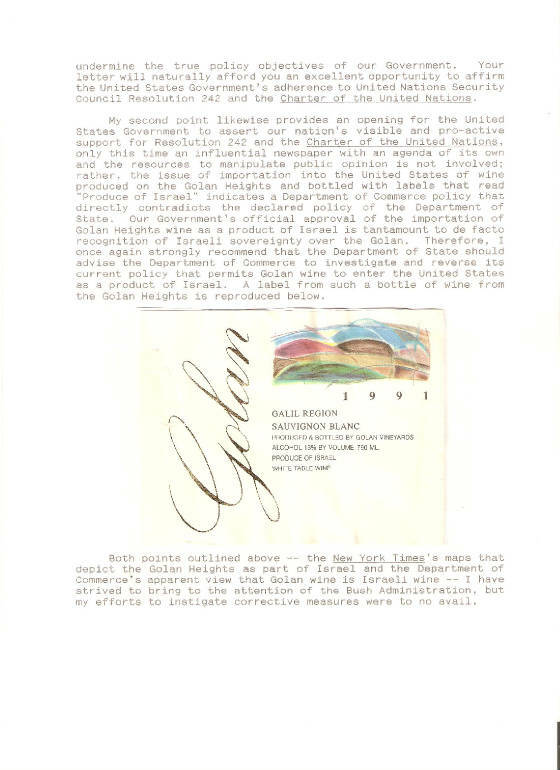 At issue were maps of The New York Times showing the Golan Heights not as occupied territory, but as an integral part of the Zionist state, and Golan wines, which are imported into the USA with labels marked "Produce of Israel." Both the maps and the wine labels undermine the declared policy of the USA, which is, as it ought to be, based on our lawful obligation to adhere to treaties such as the United Nations treaty and Security Council Resolution 242. But first read a letter dated 14 December 2008 to President of Syria Bashar al Asad, President-Elect Barack Obama and Secretary of State-Designate Hilary Rodham Clinton in which I point out that the deplorable situation outlined above has not changed after 16 years. 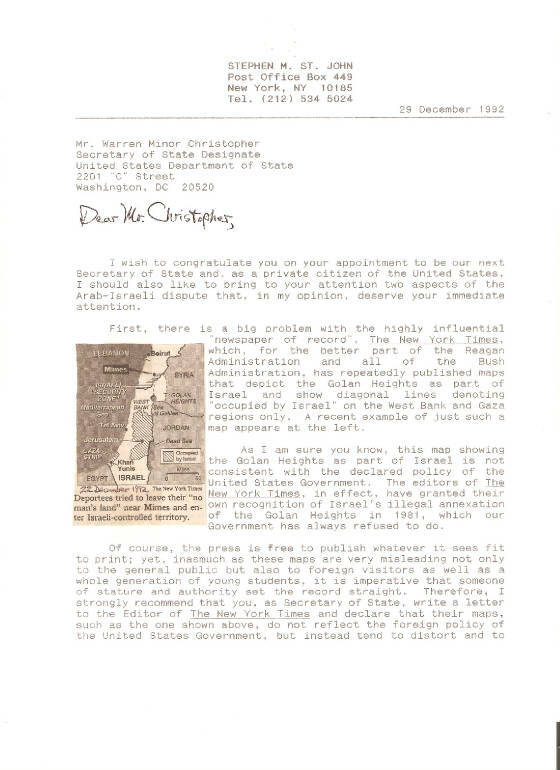 In the interests of promoting a truly comprehensive peace on all fronts of the Iranian/Arab-Zionist dispute, I invite you to turn your attention to my 29 December 1992 letter to then US Secretary of State-Designate Warren M. Christopher where I point out certain biases within institutions of the USA which must be overcome before we can ever hope for a straightforward Middle East diplomacy. Please see http://www.show-the-house.com/id49.html (Scroll down to read letter). Once you read this letter you will see that after 16 years, absolutely nothing has changed and we are still at "square one" in "the game"; hard to imagine if it were not true! There is still no US Government disavowal of New York Times maps showing the illegally occupied Golan Heights as an integral part of the Jewish state; nor has the US Government stopped the practice of allowing imported wines from the Golan as "Produce of Israel." What "confidence building measures"! I have concluded long ago that 99% of the battle for a just and lasting peace in the Middle East is right here in the USA! Of course I am hoping the new administration will be different. Obama adviser Dennis Ross oversaw the decomposition of the USA's stand that the Zionist settlements are "illegal" into a more ambiguous, Zionist-friendly slogan "obstacles to peace"; do we really need a continuation of this? I am ready to serve the cause of just peace if you are willing to consider an entirely different "two-state solution" that is a compromise anchored in UNSC Resolution 242 and inspired by the only provision in the Constitution of the USA never yet exercised. Will a revolutionary idea of our founding fathers bring peace to the Middle East? Please see http://www.show-the-house.com/id4.html. I wish to congratulate you on your appointment to be our next Secretary of State and, as a private citizen of the United States, I should also like to bring to your attention two aspects of the Arab-Israeli dispute that, in my opinion, deserve your immediate attention. As I am sure you know, this map showing the Golan Heights as part of Israel is not consistent with the declared policy of the United States Government. The editors of The New York Times, in effect, have granted their own recognition of Israel's illegal annexation of the Golan Heights in 1981, which our government has always refused to do. Of course, the press is free to publish whatever it sees fit to print; yet, inasmuch as these maps are very misleading not only to the general public but also to foreign visitors as well as a whole generation of young students, it is imperative that someone of stature and authority set the record straight. Therefore, I strongly recommend that you, as Secretary of State, write a letter to the Editor of The New York Times and declare that their maps, such as the one shown above, do not reflect the foreign policy of the United States Government, but instead tend to distort and to undermine the true policy objectives of our Government. Your letter will naturally afford you an excellent opportunity to affirm the United States Government's adherence to the United Nations Security Council Resolution 242 and the Charter of the United Nations. My second point likewise provides an opening for the United States Government to assert our nation's visible and pro-active support for Resolution 242 and the Charter of the United Nations, only this time an influential newspaper with an agenda of its own and the resources to manipulate public opinion is not involved; rather, the issue of importation into the United States of wine produced on the Golan Heights and bottled with labels that read "Produce of Israel" indicates a Department of Commerce policy that directly contradicts the declared policy of the Department of State. 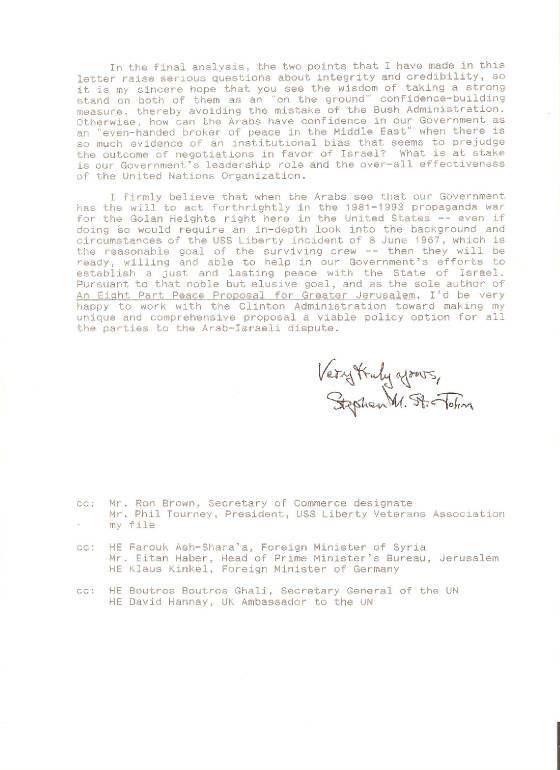 Our government's official approval of the importation of Golan Heights wine as a product of Israel is tantamount to de facto recognition of Israeli sovereignty over the Golan. Therefore, I once again strongly recommend that the Department of State should advise the Department of Commerce to investigate and reverse its current policy that permits Golan wine to enter the United States as a product of Israel. A label from such a bottle of wine from the Golan Heights is reproduced below. Both points outlined above -- The New York Times's maps that depict the Golan Heights as part of Israel and the Department of Commerce's apparent view that Golan wine is Israeli wine -- I have strived to bring to the attention of the Bush Administration, but my efforts to instigate corrective measures were to no avail. 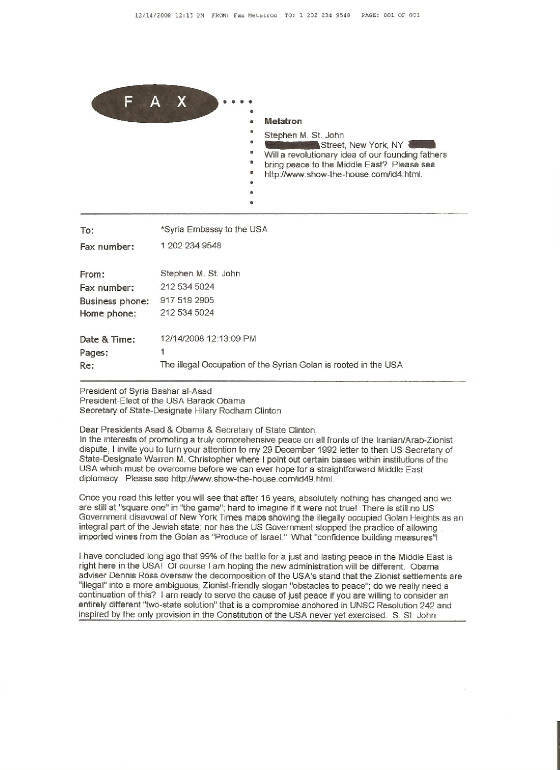 In the final analysis, the two points that I have made in this letter raise serious questions about integrity and credibility, so it is my sincere hope that you see the wisdom of taking a strong stand on both of them as an "on the ground" confidence-building measure, thereby avoiding the mistake of the Bush Administration. Otherwise, how can the Arabs have confidence in our Government as an "even-handed broker of peace in the Middle East" when there is so much evidence of an institutional bias that seems to prejudge the outcome of negotiations in favor of Israel? What is at stake is our Government's leadership role and the over-all effectiveness of the United Nations Organization. I firmly believe that when the Arabs see that our Government has the will to act forthrightly in the 1981-1993 propaganda war for the Golan Heights right here in the United States -- even if doing so would require an in-depth look into the background and circumstances of the USS Liberty incident of 8 June 1967, which is the reasonable goal of the surviving crew -- then they will be ready, willing and able to help in our Government's efforts to establish a just and lasting peace with the State of Israel. Pursuant to that noble but elusive goal, and as the sole author of An Eight Part Peace Proposal for Greater Jerusalem, I'd be very happy to work with the Clinton Administration toward making my unique and comprehensive proposal a viable policy option for all the parties to the Arab-Israeli dispute. For those who have read this far, I think you will agree that after seventeen full years, we are still stuck at square one. In 2009, The New York Times still publishes its obnoxious maps showing the Golan Heights not as occupied Syrian territory but as an integral part of the Zionist state. And the Golan wine is still imported into the USA with labels that read "Produce of Israel"! The lesson to be learned is that the principles of a sound foreign policy should be reflected first at home; otherwise, we cannot act with confidence and respect abroad. Mr. Christopher did not reply to my letter, and within a year it became apparent that the Zionists were intent on a feigned separate peace with the Palestinians. The Syrian Golan Heights issue was off the agenda altogether at Oslo and throughout the administration of George W. Bush. Now we can only hope that the Barack Hussein Obama Administration will be more forthright in its approach to the Middle East, first at home and then abroad.